KINGSTON, R.I. (AP) — Xavier Munford scored 27 points on Saturday and Rhode Island shot 62.5 percent from the field to defeat Dayton 88-76. URI’s overall shooting was better than its 57.5 percent free throw percentage (23 of 40) and tied for the fourth-best overall shooting performance in program history. Rhode Island (11-10, 2-4 Atlantic 10) had a 15-point first-half lead before Dayton scored seven straight to close the period within 39-31. The Flyers scored four more points to open the second within 39-35, but the Rams answered with a 16-2 run. Dayton made a late run to pull within 79-72 with 1:53 left, but Rhode Island scored four points on its next possession to seal the game. E.C. Matthews had 20 points and 10 rebounds, Gilvydas Biruta scored 15 and T.J. Buchanan added 11. 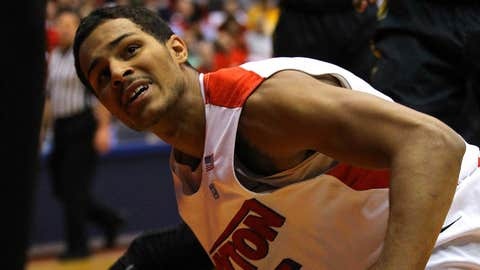 Dyshawn Pierre led Dayton (13-7, 1-4) with 17 points, Devin Oliver had 16 and Matt Kavanaugh 13.